As sweet as cinnamon: It's a BOY! Funny how they grow up and have kids of their own..
Can't wait to give him a big cuddle. Mummy and Daddy doing well. 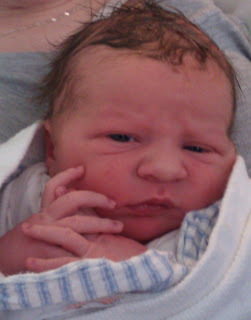 Big Congratulations Dawn he is Beautiful...Glad to hear all is well with Mum & Bub. es ist ein ganz enzückender kleiner Junge. Congratulations Nana Dawn. He is beautiful. You certainly have your hands full now. One for each knee. Congratulations Dawn - he is absolutely gorgeous!!! What a lovely addition to your family! Awwww Dawnie he's ADORABLE!!!!! I just want to hold that little hand and kiss that sweet nose. Congratulations to the whole family ... what a wonderful blessing :o)!! Welcome to the world dear Thomas :o). Congrats Nana!! I'd love to see a picture of your baby son so we can compare Thomas and his dad. What wonderful news, Dawn. Beautiful little baby, and also a lucky one to have a lovely Nanna like you. Many blessings to you and all the family. Hugs, Sandy. Big congratulations and awesome news.Beautiful baby. Blessing to you and your family!! Congratulations- your Grandson is adorable! Welcome to the world, little Thomas!! And congratulations to your family! Dawn, he's just precious - what a beautiful baby boy - I hope you can give him a cuddle soon! Congratulations Dawn. Thomas is just gorgeous. Oh how wonderful! and oh how big! What a wonderful time for you and your family. Congratulations!!! Ahhhhh...he is adorable!! Congratulations Dawn!! He is perfect! Oh he's adorable! And on my birthday no less. Smile! Congratulation with your new title. You will love it. Becoming a nana is very special :-). Woooohooooo!!!! Congratulations Nana Dawnie!!!!!! Little Thomas is THE MAN....what a cutie pie!!!! You'll be itching for a trip west now, I bet!!!! Congratulations Nana! He looks very cuddly and I bet you 'waste' some time with him :D.
congratulations Nana!!! I am sure he will be the apple of your eye! He is just beautiful! So precious, so new! Babies are the best gift! Congratulations and I hope you get to see that precious boy soon Nan! Great news. ongrats to all . Congratulations, Dawn! He is an exquisite child. Wow, he is soo cute, makes you want to give him a big cuddle. Congrats on your gorgeous new addition. Oh Dawn, he is adorable. Being a Nana is the best, isn't it? I could pinch his cheeks and give him a big squeeze. Congratulations!! CONGRATULATIONS NANA!!!!! What wonderful news!!! And what a wonderful photo - Thomas is so cute! There's nothing like the news of a newborn babe to make a gal's day!!! Big hugs and love to all!!!!! Congratulations to all of the family! He's a cutie pie! I saw him on Facebook too......he looks like his daddy I think........scares me to think I taught Daniel and Matt in Sunday School now they are dads! You are gonna be a great Nan........love you to the moon and back girl! Congratulations to you all. So exciting!! Little Thomas is just THE cutest little bundle ever. He is just asking for a hug. Look at those beautiful long fingers, and the cute little face.